flat boat with a hand pulled rope for power. It was one of many such Ferries operated across what is now southern Harris County. Lynch's ferry was on the main land route from South Texas to the Mexican border. On January 1st 1830 he received an operating license from the ayuntamiento in San Felipe. After the fall of the Alamo in March 6th, 1836 the colonist living in Texas started a mass exodus, known as the Runaway Scrape" to the east just ahead of the Mexican Army.At times there were as many as five thousand men women, children, wagons and livestock waiting to board Lynch's Ferry and head toward the safety of the Sabine River. In April 1836 General Sam Houston and his "rag tag" Texian Army were also retreating to the east just ahead of Mexican President Santa Anna and the main body of the Mexican Army.On April 18th Houston received intelligence that Santa Anna and the Mexican Army were heading toward Lynch's Ferry.On April 21st, about a half a mile southwest of the west landing of Lynch's Ferry, General Sam Houston and the Texian Army attached the Mexican Army at San Jacinto.The Battle of San Jacinto last only 18 minutes and the Mexican Army was defeated. Nathanial Lynch died in 1837 but his family operated the ferry for years. 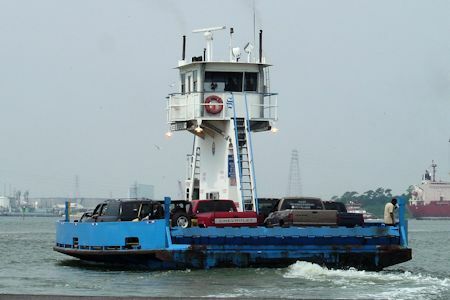 In 1880 Harris County operated Lynch's Ferry and the fares were dropped and it has operated as a free ferry service ever since. Today the ride across the San Jacinto River which is part of the Houston Ship Channel, takes less than 5 minutes. Two boats, the Ross S. Sterling and the William P. Hobby., each carry a maximum of 12 cars. 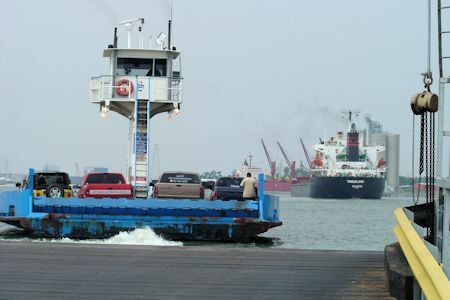 Don't even think about getting out of your vehicle, the trip is just too short and there is no place for you to go.Just sit back and enjoy a quick trip as these small nimble boats dodge the cross traffic of large sea going vessels going up and down the Houston Ship Channel.